The metro system of Amsterdam was opened in 1977. 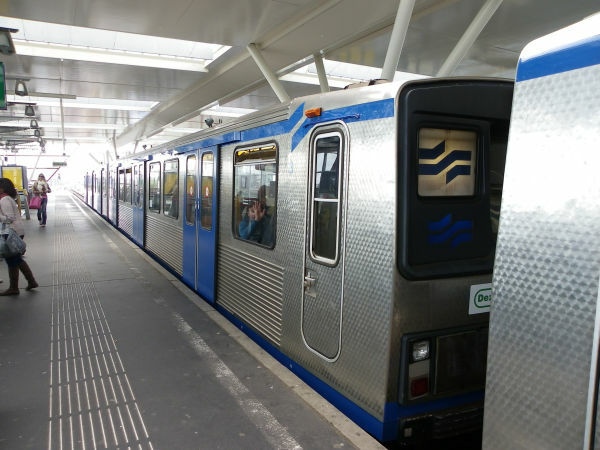 The first metro trains consisted of three series called M1, M2 and M3. All three were made by Linke-Hoffman-Busch of Germany, which today is Alstom. Trains numbered 1-4 were of the M1 batch from 1973, 5-37 were of the batch M2 of 1976-77 and numbers 38-44 were of the series M3 from 1980. They were all sivery trains, characterised by their unpainted aluminium bodies. They were two coach units, each weighing 57 tons, being 37,34 m long and having a top speed of 70 km/h. Each train unit had six doors per side. All trains got their electicity from a 750V DC side rail. Today all these M1-M3 trains have been taken out of service since 2015. Lastly they were mainly only used on the metro lines 50, 53 and 54. 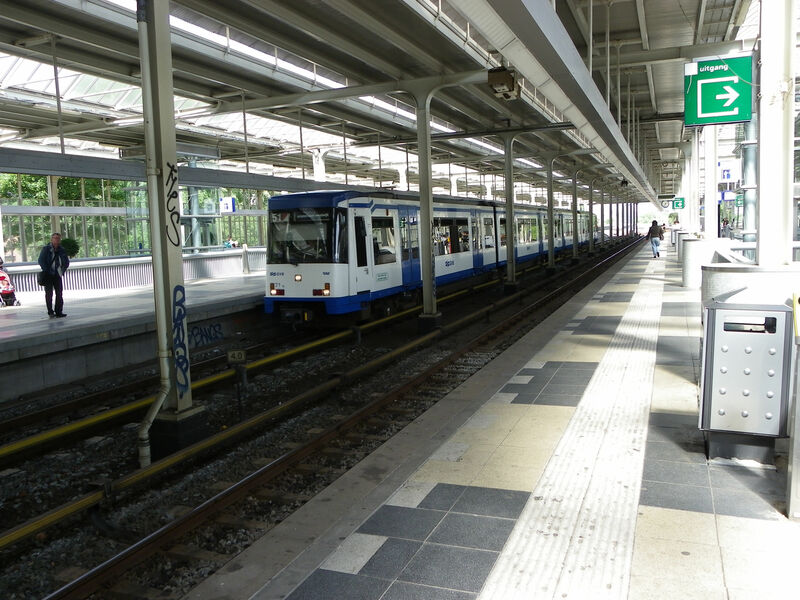 This one is of the very first series, an M1 train. All M1-M3 trains have now been scrapped, except for one train no. 23. 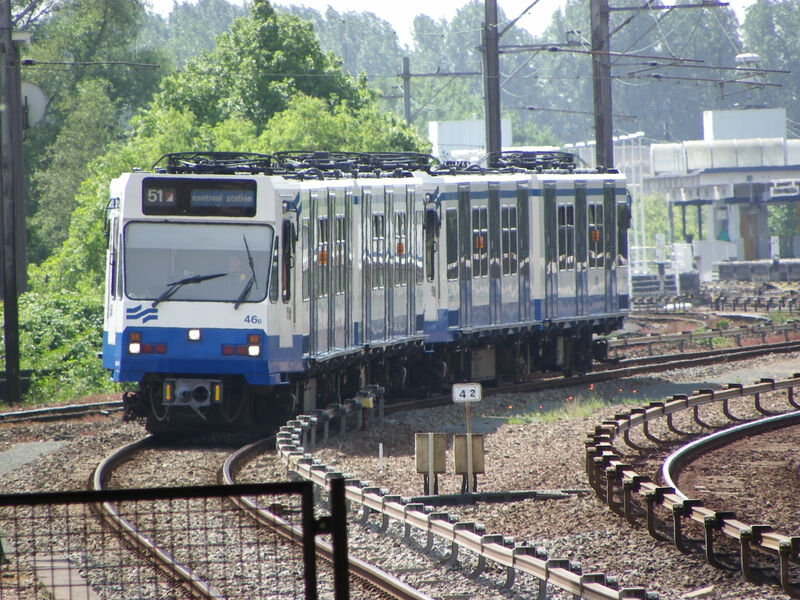 Picture of M1 Amsterdam metro no.03 at Duivendrecht 23.5.2011 by Ilkka Siissalo. The same metro train no. 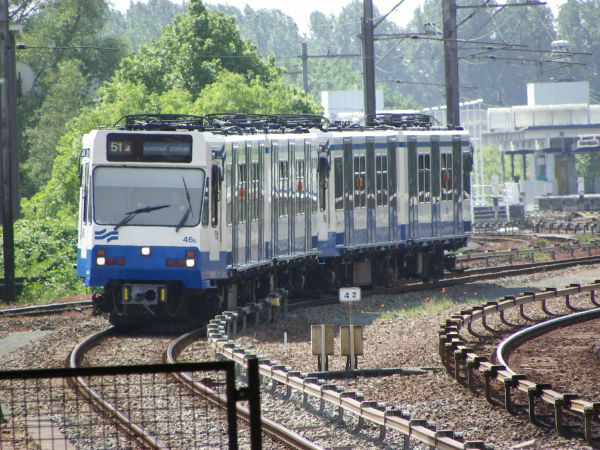 3 as in the picture above, here leaving Duivendrecht station while serving on line 53. 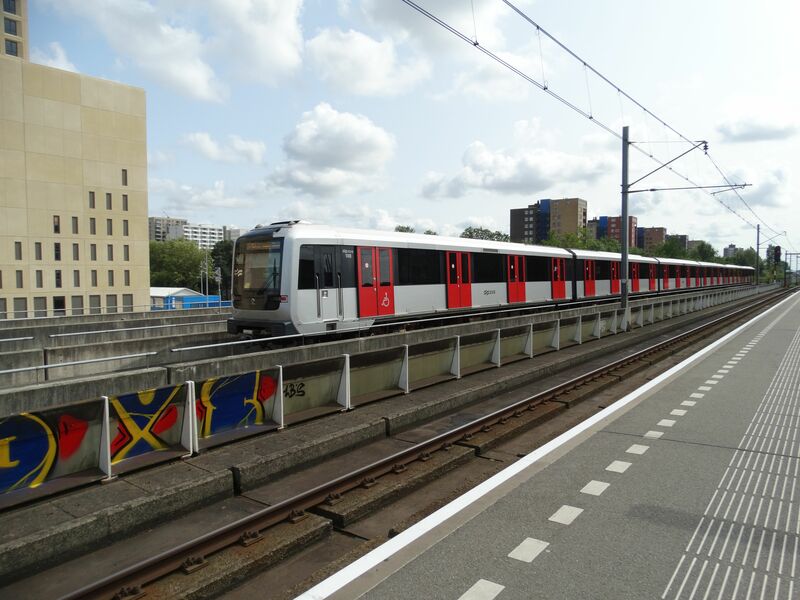 Class M2 metro train no.30 serving on metro line 54 stopping here at the Amstel station. Picture at Amstel station 23.5.2011	by Ilkka Siissalo. Class M4/S3 metro train of Amsterdam. These trains are narrower. It is a 30 metres long, six axle fixed train unit, built by CAF in Spain. It has 66 seats and room for 184 standing passengers. Top speed is 70 km/h. To be quite precise, this is an S3 train. They are the same as M4, but have also pantographs. Only four M4 trains have been fitted with pantographs to make them of the type S3 and only these four of this class can operate on route 51 as is the case here. Pantographs are needed at part of the route 51. An approaching train consisting of two class S1 / class S2 units. These trains are not called metros but light rail trams. 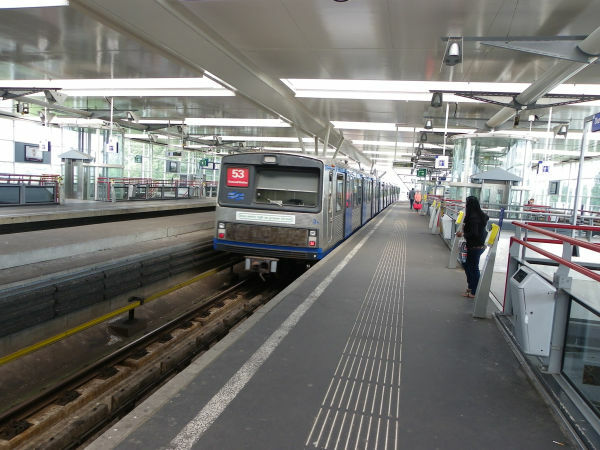 They can operate both using the metro 750V DC current from a side rail or on 600V DC from an overhead catenary. 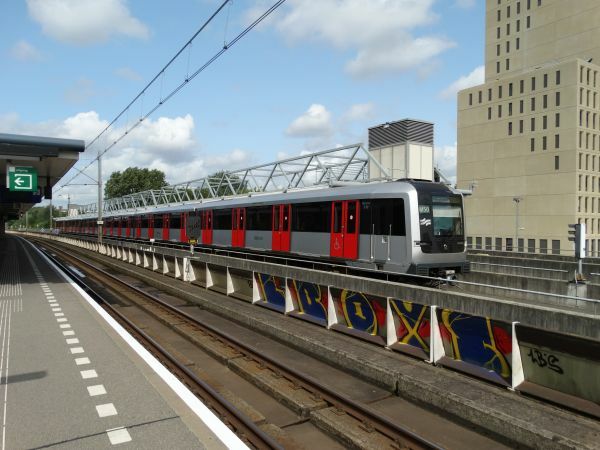 They can be used on a metro line, like here on metro line 51, but also as light rail trams on the "Sneltram" route to Amstelveen. One unit is 30 metres long, has 64 seats and place for 169 standing passengers. Note the extended running boards, so called footboards at the sides. Trams are narrower than metros, so these trains need extra widening boards to close the gap between the train and metro station platforms when they operate as metro trains. These footboards are retractable, so they will not show when the unit works as a tram. 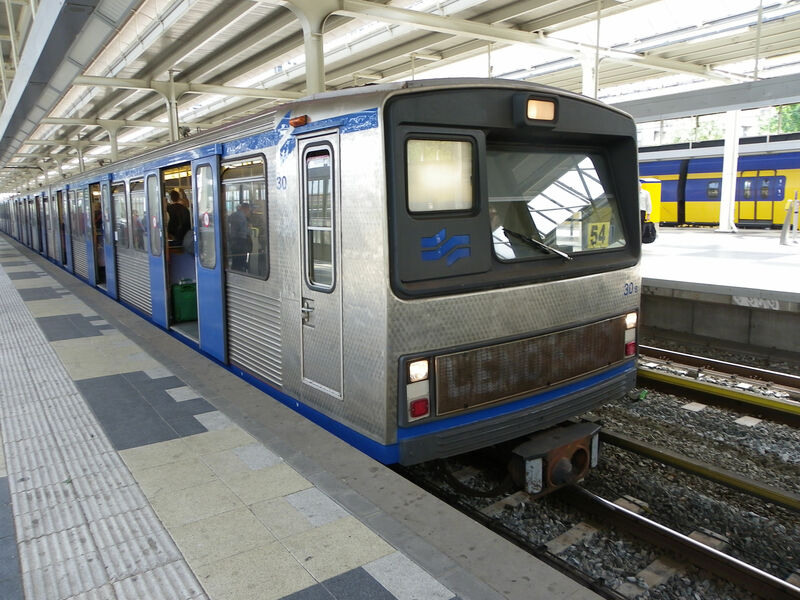 These trains were made by La Brugeoise et Nivelles SA in Belgium and they have been in service since 1990. The first unit of this pair in the picture is an S2 class train no 46. Picture from Amstel station 23.5.2011 by Ilkka Siissalo. Another picture of the same train as above while it is stopping at the Amsterdam Amstel station. 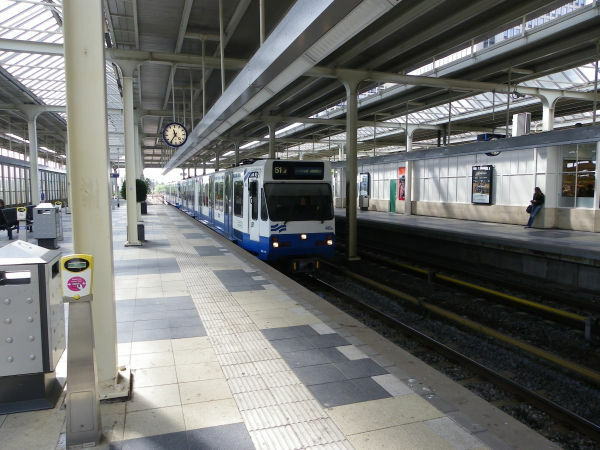 A similar pair of S1/S2 trains as they are stopping at the Amstel station on line 51. Now the nearest unit is a class S2 train no.45. Here the retractable footboards can clearly be seen. Pantographs are lowered here as the train is rinning as a metro on 750V DC from a third rail. 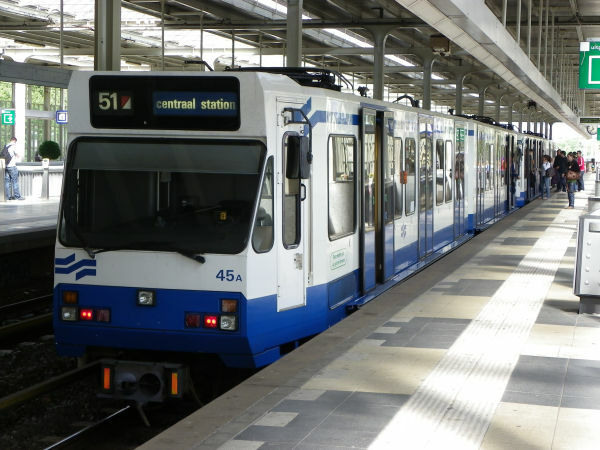 The new metro trains of Amsterdam are called M5. They are six coach trains with a total length of 116,2 metres and a top speed of 90 km/h. Each train has in total 16 electric motors, each producing 200 kW of power. The first M5 trains were taken into use in 2013. They are built by Alstom and GVB has now in total 26 of such trains. They are used on routes 50, 53, 54 and will be used on planned route 52. Here an M5 train is stopping at the Lelylaan station in Amsterdam. Picture 20.7.2017 by Ilkka Siissalo. Another picture of an M5 metro train, here just leaving Lelylaan station.